This products directory provides links to products for sustainable building and green living. Apricus solar water heaters use evacuated tube and heat pipe technology to absorb thermal energy from the sun and convert it into usable heat. The heat is normally absorbed by water, or a freeze-resistant water mix, which can then be used to supplement hot water heating, space heating and even space cooling via use of an absorption chiller or dessicant cooler technology. Heatkeeper Radiator PanelsHeatkeeper Radiator insulation panels significantly reduce the heat loss through external walls by directing the heat evenly back into the room by creating a air curtain that rises above the radiator minimising the loss of heat energy produced . Renshade perforated aluminium foil screens fitted inside windows can dramatically reduce room temperatures. The foil screen is simply cut to size using scissors then fixed with Velcro buttons. The manufacturer claims that the screens stop approximately 85% of all inward high temperature radiation. Magnetite window insulation provides and affordable alternative to double glazing that can be retrofitted to your existing window frames. You obtain the benefits of double glazing in including noise reduction and energy efficiency. ModWood is a timber substitute wood composites product that is made from recycled wood and plastic. ModWood looks and feels like natural timber, but require none of the maintenance of traditional woods. You will not need to paint or stain ModWood products as they come in three contemporary colours (Redwood, Tallowwood and Grey). ModWood provides a good sustainable solution for decking. JM Insulation manufactures formaldehyde-free insulation that is made up of more than 50% post-consumer recycled glass. It is better for you and the environment because it reduces toxicity in the home, reduces temperature fluctuations and is made from more recycled glass than any other insulation. Aerobin is a technological breakthrough in home and garden waste management. It uses a patented "lung" or aeration core inside a sealed bin to promote aerobic break down of organic matter, which experts say is the preferable method to reduce greenhouse gas emissions. The Bokashi Bucket is a revolutionary fermentation process that turns your kitchen waste into a rich soil conditioner. This unique composting system uses the revolutionary EM (Effective Micro-Organism) Bokashi to create the ideal conditions for airtight (anaerobic) composting. The odours and unpleasantness associated with putrefaction and decay are eliminated. EcoVerta - is an incredibly simple yet amazingly effective water saving solution. In an average home approximately 10% or more of the total water consumed is lost whilst waiting for tapware to run hot.This water can now be saved without ongoing energy costs or associated greenhouse gas emissions. Advanced Eco Technologies - revolutionary new EcoVerta design enables these unique systems to divert water at full mains pressure without the need for any external power. This enables the cold "hot" water, which would normally go down the drain, to be captured and diverted for re-use, into a storage tank or for direct distribution throughout the garden. All models are compatible with mains pressure water heating including solar, heat pump, storage heaters and continuous flow systems. Proudly Australian Made the EcoVerta range carries Watermark approval to AS1357.2, certification by both Good Environmental Choice Australia and the Smart Approved Watermark expert panel. eco sac water storage- a revolutionary, new flexible rainwater bladder storage system that hides away under decks or floors making it much more discrete than traditional water tanks. Bladder Tanks and Pumps- Bladder water storage tanks for delivery to Sydney, Melbourne, Brisbane, Canberra, Adelaide and Australia wide. Pressure pumps & water tank accessories also available. Online prices include delivery, which is within a week. Comparison Plastics Pty Ltd – Plastic Water Tanks come in a variety of colours, shapes and sizes. We are custom rotational moulders & manufacturers of plastic water tanks with 25 experience. Plastic Water Tanks -- Plastic / Polyethylene Rain Water Tanks | Grey Water | Water Storage & Saving Systems). Easy installation in areas with limited access. UV Stabilized (resists hardening or cracking). Reinforced polypropylene for added strength. No frames required. Overflow to Storm Wate. 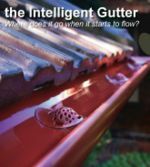 Can capture water from most of the roofed area rather than one or two down pipes as is the case with conventional rainwater tanks. Easily connected to existing garden systems. Take with you when you move house. Eligible for Government Water Rebate. 100% Australian Owned. Designed and manufactured by a local Melbourne Small Business. Rainwater Tanks and Pumps - Slimline water tanks, round rainwater tanks and rectangle rain water tanks. Online prices for delivery to Sydney, Melbourne, Brisbane, Canberra and Adelaide, Australia. Water pumps & water tank accessories also available. Rainwater Tank Pumps - Full range of Rain Water Tank Pumps to choose for connecting to your rain water tank, storage tanks or bladders. We delivery Australia Wide - Sydney, Melbourne, Brisbane, Canberra, Adelaide, Tasmania, Perth and Northern Territory. Greywater Gator -- system for capturing and pumping out greywater (but not treating it). 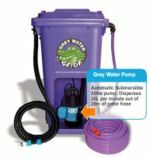 Grey Water Pumps - Full range of Grey Water Pumps to choose for pumping your grey water to watering your garden. The pump can connect to drip irrigation, low pressure sprinklers or drippers and to your hand held watering system. We delivery Australia Wide - Sydney, Melbourne, Brisbane, Canberra and Adelaide, Tasmania, Perth and Northern Territory. Waterwall Solutions creates modular rainwater storage systems for urban Australia. Innovative and contemporary in design, Waterwall products aim for maximum capacity, minimum footprint. They are ideal for using along fence lines or under eaves. Be prepared to change the way you think about rainwater storage. Forest friendly timber can be difficult to source, particularly for applications such as window frames. Do you research carefully and well ahead of your building project. This page was last modified 23:34, 8 February 2011. This page has been accessed 99,824 times.